Mrs. Mary Alice Thomas, 83, of Radcliff, KY, died on April 16, 2018 at her residence. Mrs. Thomas was a native of Trenton, NJ and the daughter of the late Curtis and Mattie Lemon Brooks. 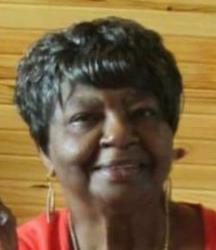 She was a member of First Baptist Church, Eastern Star and Rising Star. Mrs. Thomas was the former manager of the Fort Knox NCO Club. She was preceded in death by her husband, John Thomas; daughters, Sheila Odom and Cornelle Hughes; two sisters and four brothers. Survivors include one son, Vincent Ross of Radcliff, KY;one daughter, Jocelyn Edge of New York; two sons-in-law, Bruce Odom and Michael Hughes; one sister, Lenora Jenkins six grandchildren, Kele' Odom, Kara Odom Stewart, Kyra Ross, David Reed, Keith Odom and Meko Hughes and eight great grandchildren..
Funeral service will be held at 11:00 am on Saturday, April 21, 2018 at First Baptist Church in Elizabethtown, KY with Rev. Roderick Jones officiating. Burial will follow in North Hardin Memorial Gardens in Radcliff. Visitation will be from 9:00 am to 11:00 am on Saturday, April 21, 2018 at First Baptist Church. Dear Family, I'm so sorry to hear of the loss of your loved one. My sincere condolences to you. May you think of the many beautiful memories that you shared with Mrs. Mary, and cherish those precious moments. May the God of all comfort caress your heart with his living promise to one day reunite you together again in the future paradise mentioned at Revelation 21: 4,5. Our Dear Heavenly Father Jehovah (Psalms 83:18 )knows the many tears you cry and he will sustain you if you let him. I was thinking of you and hoping that you can find comfort during this difficult time.